"Get your start menu back in Windows 8 with Start Menu 8"
Whoa! What happened to the start menu? Where did it go? Without even as much as a simple poll asking their users whether or not it was essential to our every day usage, Microsoft has decided to do away with the classic start menu in Windows 8 and opt for the metro ui; however not everyone is a fan of this change (that probably includes you too if you’re reading this now). No one really knows why Microsoft decided to get rid of the start menu, however it sure did stir up enough controversy to get people to pay attention to the new system. If that was a part of their master plan, it worked, but it was extremely unnecessary. They could've at least provided us with an option to turn the start menu back on. 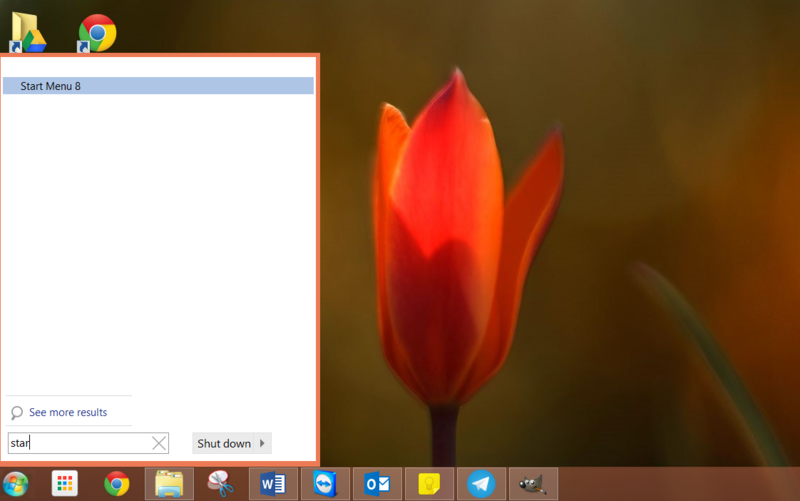 If you’re looking for the ease of use and familiarity of the classic start menu, look no further. Start Menu 8 has just what you’re looking for. You get back the familiar look and feel of the Windows 7 start menu plus an option to try out Start Menu 8’s very own take of what the start menu would look like if it were designed for Windows 8 using with the flat metro design rather than the Windows Aero look that we came from. While the metro designed start menu does look nice, I prefer the Windows Aero look on the start menu instead. It could be that I'm resisting the change, but the Aero start menu was perfect, in my opinion, and shouldn't have been changed. Every program has its bugs; however, this release of Start Menu 8 might have a little bit too many bugs for daily use right now. Many of us enjoyed being able to search for applications within the start menu. 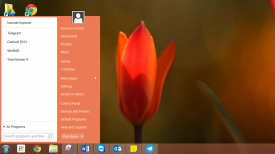 While the feature is there for Start Menu 8, the execution has not quite yet been polished. The program often freezes when you attempt to search with a word longer than 4 letters and it does not play nicely with the spacebar. Not only does this leave you with a non functioning (not responding) start menu, this also renders the left hot corners (the corners that allow you to acces your running programs and the Windows 8 metro start screen) unresponsive until you reopen Start Menu 8. 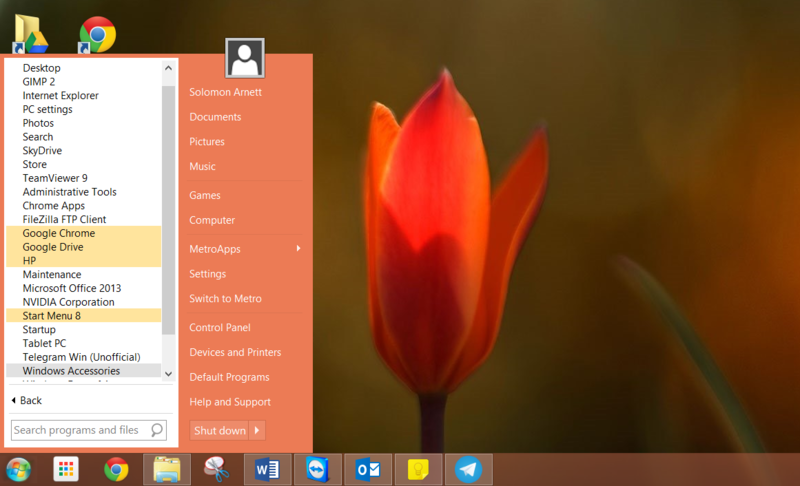 Besides that, Start Menu 8 does a very good job visually replicating the classic start menu and brings back the ease of locating your favorite applications. Users familiar with the Metro UI on Windows 8 can attest that unless you search for the name of the application that you are looking for, it is quite difficult to locate it. In fact, I have yet to understand the way in which Microsoft has organized the "Applications" section of the Metro UI. Applications are separated into various categories. Sometimes even applications within the same suite will be separated from each other making it all the more difficult to locate an application when you cannot remember the name. When you think that an application would be placed under one category, you're wrong and Microsoft has placed it under a completely different one.